Last year's RIO at Teatru Astra by the YADA Dance Academies, Gozo and Tarxien together with the College of Dance was a phenomenal success with a sell out. The same three schools are this year collaborating again and building on last year's show with a new performance at Teatru Astra on Saturday the 6 April 2013. 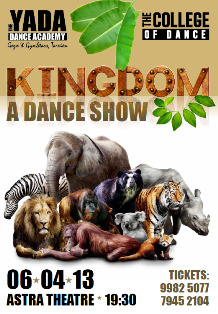 KINGDOM will be a colourful show inspired by music from movies that involve the wonderful world of animals. With a cast of 200 talented and young Gozitan and Maltese dancers and famous choreographers the likes of Justin Roy Barker, Felix Busuttil and Daron Galea surrounded by a team of other creative choreographers, this show will certainly amuse. With music from Black Beauty, Shrek, Dances with Wolves, The Black Swan, Happy Feet, Madagascar, The March of The Penguins, Born Free and many more YADA's shows are always very entertaining, light- hearted but definitely worth watching with strong technique and theatrical exuberance. You will experience the building young blocks of the future adult dancers of Gozo and Malta. Tickets at only €15 and €12 can be bought from the Teatru Astra Bar and if you also wish by phoning hotlines 79452104 and 99825077 mornings and afternoons. Support Teatru Astra, support Maltese emerging dancers, support Art. Do not miss... This is yet another show you will want to watch... Bears, swans, cats, lions, penguins, mice and all that moves....!! !